Oh dear, I've sort of been neglecting this blog lately, but I've got a bunch of different things I want to write about so hopefully I'll be getting back into it. 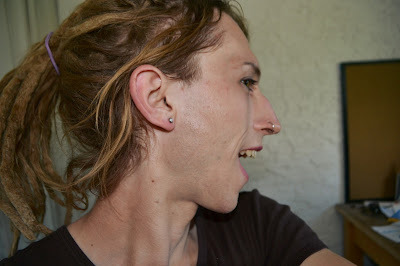 I guess pierced ears aren't really a gender thing per se: lots of boys have them and lots of girls don't, and even before I began questioning my gender I'd considered getting it done. But they do give me the option of sticking feminine jewelry in there, which is just one more cue I can use to help people read my gender correctly, so that's nice. On an unrelated note, I just finished reading Nevada by Imogen Binnie and I absolutely loved it. Like seriously, if you want to read a novel with realistic, complicated trans characters, you should check this book out.